So you don't just end up with loads of pancit. (SPOT.ph) While Christmas is the most wonderful time of the year, it’s also the most stressful. From gift shopping to planning family reunions and holiday get-togethers, all the busy preparations can sap the fun and happiness out of the holidays. Thankfully, some of your favorite restaurants offer party trays and group packages to make party planning a little less like a giant obstacle. Whatever your food preference and budget is, here are some great options. Go beyond the usual favorites and spice up your spread with some Vietnamese fare. P.H.A.T. Pho offers sets of their best-selling dishes in combo trays, perfect for office parties or when you want something delicious and convenient for your next get-together. Choices include Pork Satay, Chicken Satay, Pho Xao and Pork Satay Wok-fried Noodles, Slow Roasted Pork Goi Cuon and Chicken Satay Set, and Chilled Shrimp Goi Cuon and Pork Satay Set. 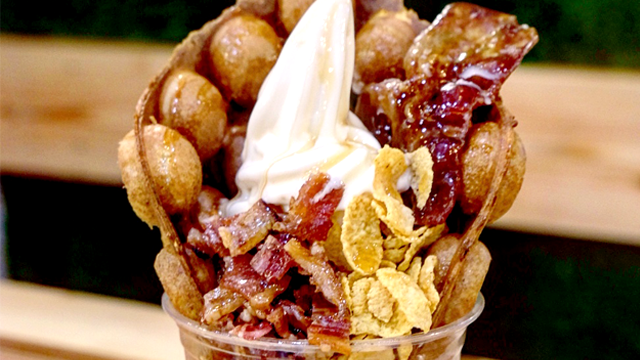 Currently, the trays are only available for pick-up at their Serendra branch. P.H.A.T. Pho is at G/F, Serendra, Bonifacio Global City. For more information, log on to P.H.A.T. Pho's Facebook page. A DIY bar is always a fun way to mix up your Christmas party. Moe’s Southwest Grill offers their signature tacos and burritos, buffet-style, so you and your guests can build your own tacos with a spread of beans, shredded cheese, lettuce, sour cream, guacamole, and pico de gallo. The set also comes with burritos, corn chips, and salsa. 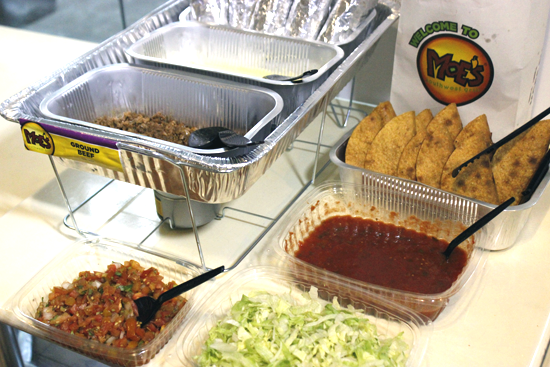 Moe’s makes party planning even easier by providing you with everything you could possibly need: holding trays, chafing dishes, plates, cutlery, and napkins. Moe’s currently offers their party packages for a minimum of 20 people, and is available for pickup or delivery to selected areas. Moe's Southwest Grill is at 4/F, Uptown Mall, Uptown Bonifacio. For more information, contact 805-2246 or 0916-239-2048. The Holiday Rib Platter is perfect if you’re planning an intimate dinner with family or you’re only treating a small group of friends. Racks’ holiday group meal features their signature ribs glazed with a special sweet-spicy sauce plus crispy Waffle Fries and Sauteed Beans and Carrots. 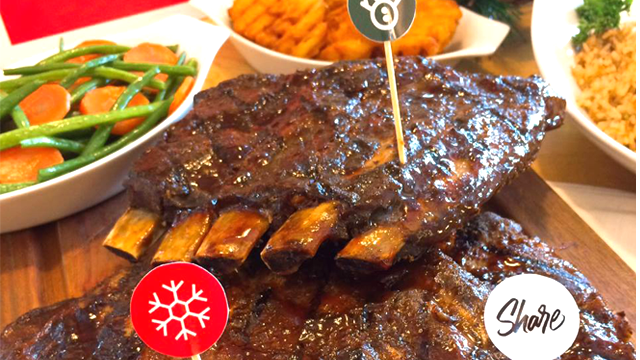 What’s more, proceeds from the Holiday Rib Platter will go to World Vision’s Noche Buena Program, and give 100 families their own Noche Buena package. 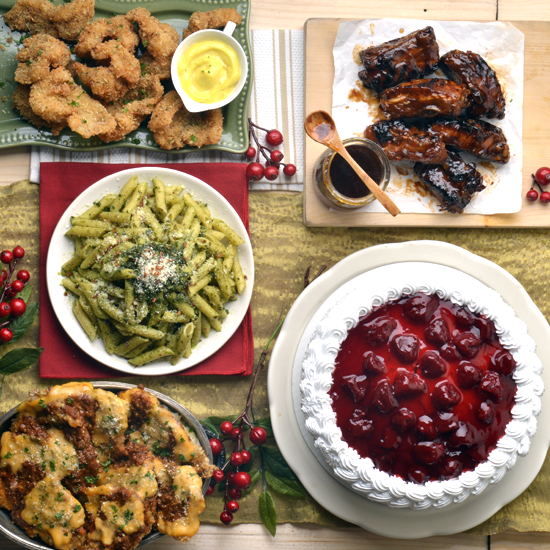 Now you can have a great holiday spread while also giving back. 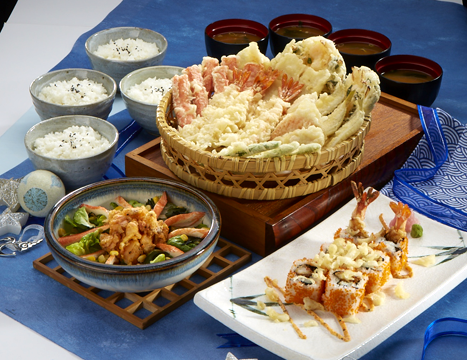 For this year’s Noche Buena, try something new and bring your family and friends to Tenya for a Japanese holiday spread. 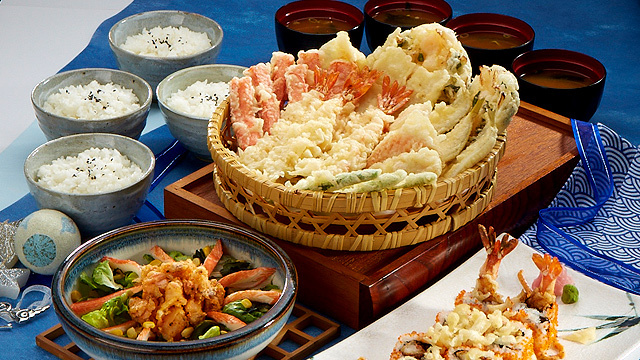 Their Holiday Ooedo set has a variety of tempura you can feast on: black tiger prawn, kani stick, squid, kisu, sweet potato, kakiage and green beens, which you can pair with rice, Spicy Salmon Salad, and Ebi Tempura Maki. Tenya Tempura Tendon is at 4/F Building A, SM Megamall; Food Street, UG/F, SM Southmall; G/F, Market! Market!, Bonifacio Global City; and 2/F, BGC Stopover Pavillion, Bonifacio Global City. For more information, log on to Tenya Tempura Tendon's Facebook page. 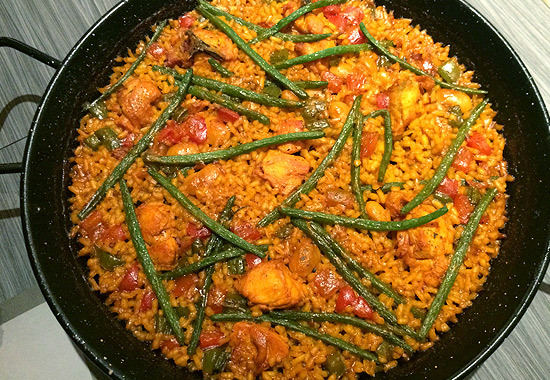 ArroZeria's vibrant paella will surely be the star of any holiday dinner spread. 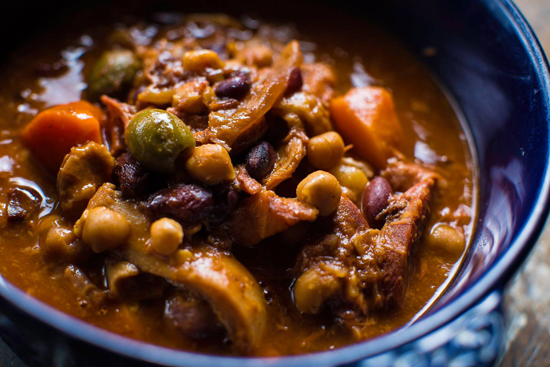 You can have your choice from the Spanish restaurant's best-sellers like Paella Abanda (seafood), Paella Negra (squid-ink and octopus), Valenciana (chicken, rosemary, and beans), and Rossejat (beef shank, pork knuckles, chorizo, and chickpeas). Plus, ArroZeria delivers anywhere in Metro Manila. How's that for convenient? ArroZeria is at 4/F Century City Mall, Kalayaan Avenue corner Salamanca Street, Makati City; and Bonifacio High Street Central, 7th Avenue, Bonifacio Global City. For deliveries, contact 212-1212. Don’t know where to meet your friends for Christmas? Head over to Rue Bourbon for some pizza, ribs, and chicken wings. Your buddies have probably seen you through all your best and worst moments, so it doesn’t really matter if you get your hands messy in front of each other. Packages also come with two barrels of Rue Bourbon beer and two teapots of Jester’s Cocktail so you’re guaranteed a Christmas night-out you won’t forget. See a list of Rue Bourbon branches. For more information, log on to Rue Bourbon's Facebook page. Having your tita over for the holidays? They’ll surely be happy with Rustic Morning’s holiday trays. The brunch place from Marikina offers some of their signature comfort food like Beef Ribs, Spanish Callos, and Seafood Paella in party trays perfect for 10 people. Bring one to the family reunion! Rustic Mornings by Isabelo is at 11 Isabelo Mendoza Street, San Roque, Marikina City. For more information, log on to Rustic Mornings by Isabelo's Facebook page. 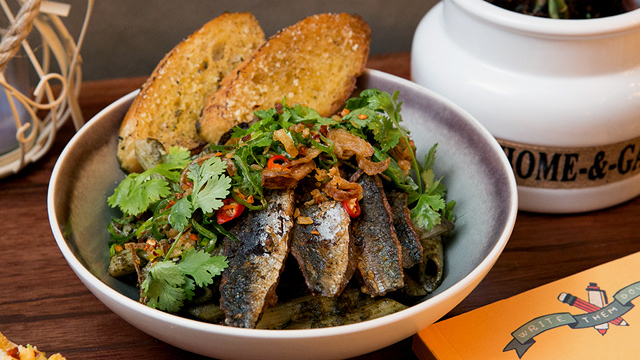 For Filipino potluck classics with a twist, head over to Manam. 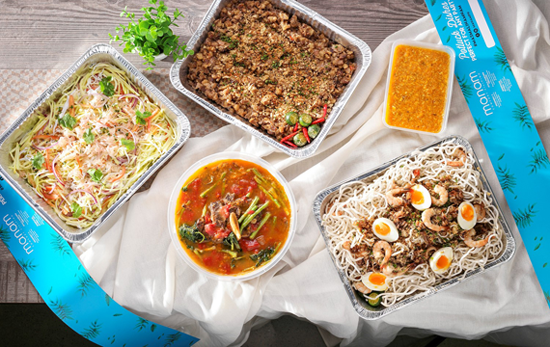 The hip Pinoy restaurant has always served their dishes in shareable portions, but this time they are offering XL trays that are good for 10 to 12 people, perfect for potlucks and parties. We recommend their Lamb Adobo, Sizzling Corned Beef Belly Kansi, and of course, their addicting House Crispy Sisig. Manam is at Level 1, Greenbelt 2, Ayala Center, Makati City; and G/F, Net Park Building, 5th Avenue, Bonifacio Global City. For more information, log on to Manam's Facebook page. Banapple is the go-to restaurant for comfort food in generous portions, and they are now offering party trays that are perfect for get-togethers. 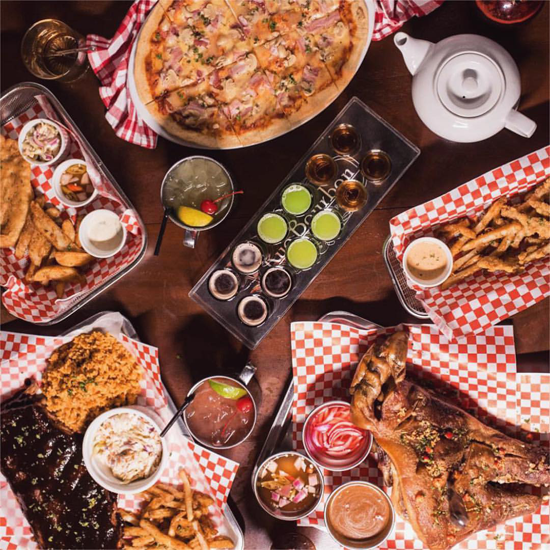 Banapple offers almost everything from their menu as party trays so you can have your choice from favorites like Lasagna Rollups, Hickory Smoked Barbeque Country Ribs, and Salpicao Rafael. Maybe order a Banofee Pie too to complete your feast. 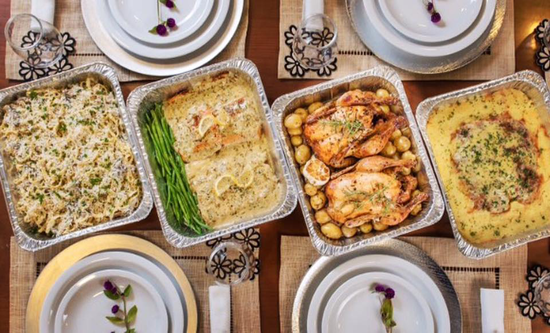 While Lily & Rose is a gourmet catering service, they also offer party trays for potlucks or quick holiday reunions. Their selections are pretty indulgent and fit in perfectly with your Pinterest-inspired table setting. Some of their offerings include Italian Meatloaf, Seared Salmon in White Wine Sauce, Tuscan Lemon Kitchen, and White Truffle Mushroom Pasta. Take photos of their elegant trays quickly, because your guests will surely eat everything up in no time.